Is There an Industrial Property Revolution? IF YOU HAVE ever bought something online, you probably haven’t put much thought into the detailed process from purchase to delivery. With the rise of online retailers such as Amazon, this process has become very systematic and sophisticated using a mix of advanced technology and human labour to pick, pack and send orders. This process usually takes place within an industrial warehouse. In 2016, there were just over $4.5 billion in industrial sales nationally, slightly above the five year average of $4.3 billion. According to research from Colliers International, this upward trend is set to continue with strong demand from offshore Asian-based investors and Australian-based local funds. So why is demand rising for this type of property? Demand for inventory storage, distribution centres and retail warehousing is in line with the general rise in online shopping in Australia. Food processing and storage facilities are also highly sought after while there is opportunity locally for businesses to take advantage of rising export demand from countries such as China. Furthermore, a low interest rate environment, strong GDP growth and a weaker local dollar (which can encourage an increase in net exports) have all contributed to this demand. More jobs and economic hubs are being created outside of metro areas including south east Queensland, the north and south coast of New South Wales, on the outskirts of Melbourne in Victoria and in the Pilbara region of Western Australia. Research from Colliers International and Jones Lang LaSalle (JLL) points to an increase in sale and leaseback programs for industrial properties. This is likely due to corporations looking to capitalise on price increases; while fund managers continue to pay premiums for stabilised income profiles. Changing technology and consumer behaviour is creating demand in this market. Evolving shopping behaviours and the growth of online retail is affecting the type of commercial space required to make mass distribution effective. 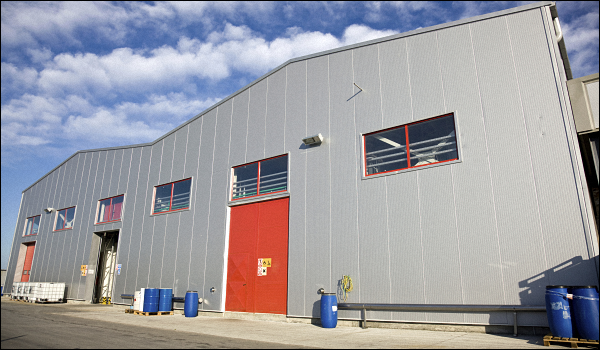 As the demand for industrial property grows across the nation, it is important for building owners to be aware of the depreciation benefits for these properties. An investor’s depreciation benefits vary depending on the type of building, its age, use and fit out. 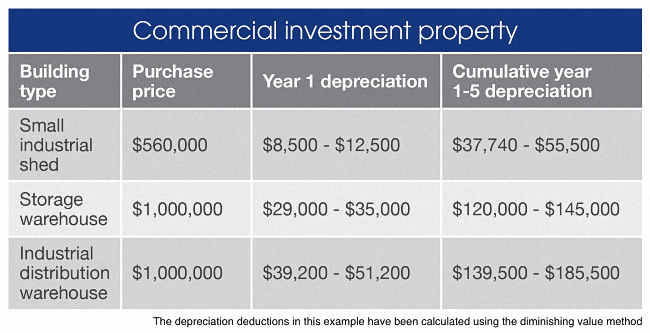 The table below highlights the substantial depreciation returns that industrial properties can provide you as an owner. Some typical assets you will find in an industrial warehouse include: lighting, mechanical ventilation, cranes and weighing systems. Bottom Line: It’s important to note that both commercial business owners and their tenants can claim depreciation and capital works deductions on industrial buildings. Owners can claim for the existing building structure, any fixed assets and plant and equipment assets they own while tenants can claim any fit out they install after their lease commences.